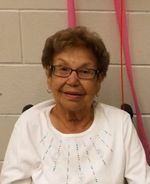 The family announces with sorrow her death in Sturgeon Falls, Friday September 12th 2014, at the age of 80 years. Daughter of the late Harry Goulais and of the late Philomene (née St Denis) Goulais. Predeceased by her husband Edward David Commanda. Loving mother of Karen Commanda (Reg) and Elaine Commanda (friend Ray) both of Garden Village. Predeceased by her 2 sons Alfred and John and by her 2 daughters Sharon and Donna-Lynn. Sadly missed and lovingly remembered by her 8 grandchildren Kelly (Mike), Scott, Renee (Dave), David (Roberta), Tyeler (Ashley), Ray Jr., Drew, Sissy and by her 5 great-grandchildren Zoey-Anne, Athena, Tehya, Connor and Hayden. Also survived by her brother Jerry Goulais (Linda) of Duchesnay. Predeceased by her brothers James, Benjamin, Maurice, John and by her sisters Alexina, Jane, Catherine and Diane. Also lovingly remembered by extended family members and many friends, West Nipissing General hospital staff and residents. The family wishes to express a special thank you to the staff at the West Nipissing General Hospital for their excellent care. The family will receive friends at Théorêt Bourgeois Funeral Home, Sturgeon Falls Monday September 15th 2014 from 2:00 to 4:00 and 7:00 to 9:00. Mass of Christian Burial will be celebrated Tuesday September 16th 2014 at 11:00 a.m. in Holy Spirit Church, Garden Village.